TOKYO, Oct 12, 2018 - (JCN Newswire) - The Mitsubishi XPANDER has added yet more awards to its growing collection of titles. It has now been named as the 2018 FORWOT Car of the Year in Indonesia, the second time it has been named Car of the Year. Earlier this year the XPANDER was awarded as Car of the Year by OTOMOTIF Tabloid and was today named the Best Low MPV(1) as well as Favorite Car by reader survey from Gridoto.com. In total, the XPANDER has obtained nine major awards since it was launched. FORWOT Car of the Year is an event held by the Automotive Journalists Forum (FORWOT). At the 2018 awards, the Mitsubishi XPANDER outperformed its competitors from various brands, classes and types. Before being selected as FORWOT Car of the Year 2018, the XPANDER had undergone rigorous judging which consisted of several stages. In the initial phase, around 60 FORWOT members from various national media (print and online) voted and the XPANDER reached the top five shortlist. Then in the second stage, FORWOT asked 33 selected journalists to provide an assessment based on the criteria from the Car of the Year Committee - www.caroftheyear.org - with adjustments made for the Indonesian market and conditions. The final judging result showed that the Mitsubishi XPANDER won 216 points, 56 points ahead of its closest competitor. The Award was handed over by Indra Prabowo, FORWOT Chairman, to Bambang Kristiawan - Head of PR & CSR Department, Mitsubishi Motors Krama Yudha Sales Indonesia (MMKSI), the local distributor. For the latest two awards, the XPANDER has now been voted Favorite Car by Survey by readers of Gridoto.com,. The XPANDER was also awarded Best Low MPV by Gridoto's expert judges, thanks to its high-end features, comfort, value for money, fun to drive and attractive design. 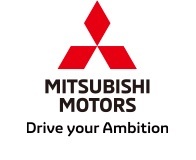 Commenting on the wins, Naoya Nakamura President Director of MMKSI said: "We are incredibly proud that the Mitsubishi XPANDER has been recognised again and again with awards. MMKSI strives to provide the best products and services for the satisfaction of consumers and the success of the XPANDER is proof that our hard work is being rewarded." 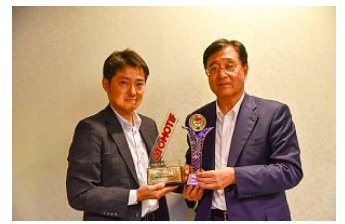 Osamu Masuko CEO of Mitsubishi Motors Corporation, (right) collects awards from Naoya Nakamura President Director of MMKSI (left).